30 July 2008, at 8:26a.m. US - A Penn State researcher sees potential in feeding camelina meal to laying hens to raise omega-3 ftty acids in eggs. 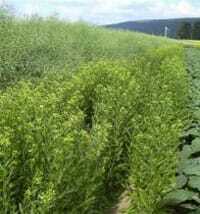 Farmers in Pennsylvania are taking part in a project run by the Penn State Cooperative Extension to grow an ancient plant, camelina, as a biofuel. "We have about 300 acres of the oilseed camelina planted on a dozen farms here," explained Joel Hunter, extension educator based in Meadville. "A few details still need to be worked out, but everything is looking good," he added. One of those details is what to do with the remaining meal after the oil is pressed out of the camelina seeds. Like the camelina oil, the meal is high in omega-3 fatty acids, which means the nutritional value of the meal is high. This should make it attractive to farmers feeding livestock, especially poultry. "The potential is there to do value-added agricultural products from the meal," said Mr Hunter. "We are hoping we can feed it to poultry for production of high omega-3 eggs." Camelina originated in the Mediterranean region. The annual plant attains heights of 30cm to one metre and has branched stems that become woody at maturity. Leaves are arrow-shaped, sharp-pointed and about 7cm long with smooth edges. The plant produces prolific small, pale-yellow or greenish-yellow flowers with four petals. Seed pods are the size and shape of a small pea. The camelina is harvested with combines when it is mature, according to Mr Hunter. The seeds are very small, amounting to about 400,000 seeds per pound, and they are 40 per cent oil, compared to 20 per cent with soybeans.